This is one of the more British style vehicles one can see in a WW2 photo. 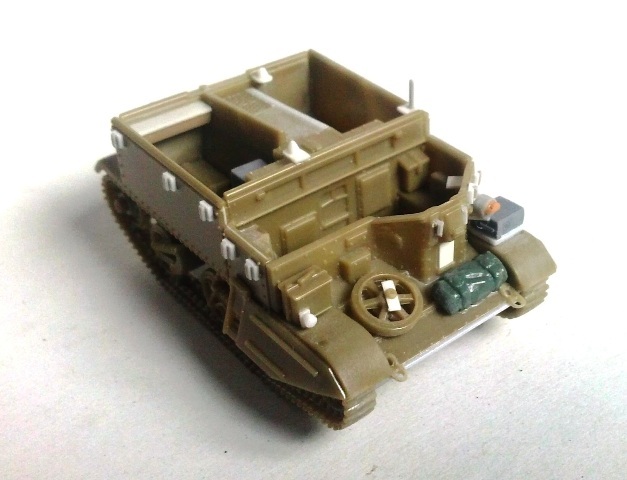 For a long time, the only way to have a Universal Carrier in small scale plastic kit was modeling the Airfix HO/OO kit, which is even smaller than 1/76 and needs a lot of work. In recent years the IBG kits filled this gap with no less than four very well done kits, each one being a different variant (Mk I, Mk II, Mortar carrier Mk II and Boys AT Mk I). PSC arrived with a quick building kit, which reflects the philosophy to have multiple simplified models. Three Carriers are given without decal set. It is a cheap and simple solution. 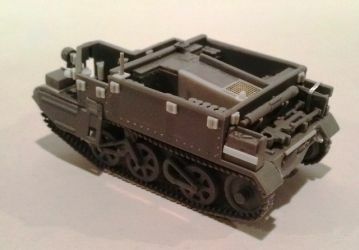 In my opinion the only really negative point shared by both manufacturers could be about the wall thickness (but to have them in the right scale they should be done with PE parts). Anyway on the later production the problem is felt only in the driver compartment because the rear compartment had a rounded handrail to protect the crew from the edge. Thinning them is not as easy as one can think. If correctly thinned the finished interior would have spacing at the engine cover and the compartments division endings. Moreover if the plates are replaced with thin plastic sheet the tiny surface details would be lost. If the plates are thinned only on the upper edge, the finished look would not be as good as one may wish, with a triangular section well visible in the corners. At the end I kept them as they are (for both IBG and PSC). 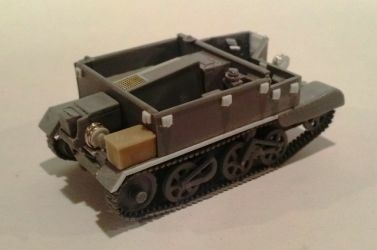 The PSC kit gives us the parts to make both Mk Is and Mk IIs, but doesn’t have the towing hook. About that, I found a bit confusing fact. Most of the sources I consulted states the Mk II had the towing hook while the Mk I didn’t. Anyway I found some photos of Mk IIs without the towing hook (and few photo of Mk I with the hook, like T79484 or Mortar CT163736). It means PSC is not exactly wrong for this. The Mk I rounded bent mudguard skirts were associated to the double lamps, but already in the Mk I batch CT199801-CT201800 there are Carriers which shows the later single lamp at left. Also T132812, a Mk I Mortar carrier of the T132736-T133149 batch, had this lights layout, but I don’t have other photos of this batch. The Mk II squared stiffened skirts were used at least by the T202177 - T203776 batch onwards. 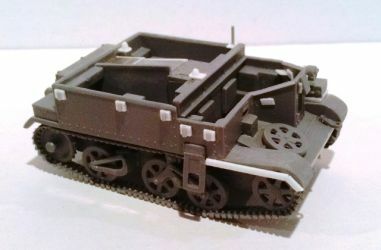 I don’t have a photo of a Mortar Carrier of the CT201801 - CT202100 batch, which could be based on the last Mk Is or on the first Mk IIs. 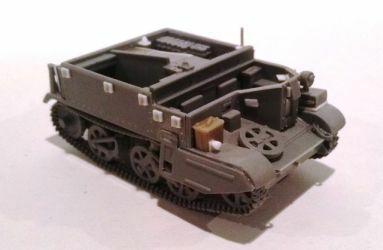 To make my models I had to try to understand a bit more about the Universal Carrier variants (ignoring the former Carrier types as well as the overseas production types) because 113,000 were produced and some differences were made along the production. What I’ve found is that the little Carrier tree had more branches one can imagine. Again I had some difficulties to understand the British nomenclature, also because there are some little differences between one source and another. The Universal Carrier was made in three Marks: I, II and III. A number before “Mk” means the engine type: No.1 (65 hp), No. 2 (85 hp), No. 2A (85 hp) and No. 3 (95 hp). A star (for example No. 3 Mk II*) meant a Canadian built carrier. Aside the Universal configuration, there were three official variants: the Carrier, Armoured, Observation Post; the Carrier, 3” Mortar and the Carrier, Medium Machine Gun. On this cover (I don’t have the book) the Mk III is referred only to the AOP variant, but in other sources the Mk III is referred also to the Universal carrier type. Although some sources I found say that starting from the Mk II the hull was welded, I think this could refer to the lower hull, because photos clearly show the riveting on the upper hull sides, at least for the following batches: T202177 - T203776, T208740 - T210400, T223384 - T223983, T226038 - T228466, T252505 - T253123, T274035 - T274648, T275608 - T276638. I didn’t find a photo of a Mk II with the welded upper hull. The kit plates are riveted; as far as one can correctly expect, the inner sides should show the inner structure of bolted “L” rods which keeps the whole together, but they are completely flat and no details are given by both kit makers. The welded hull was certainly used by the Mk III. 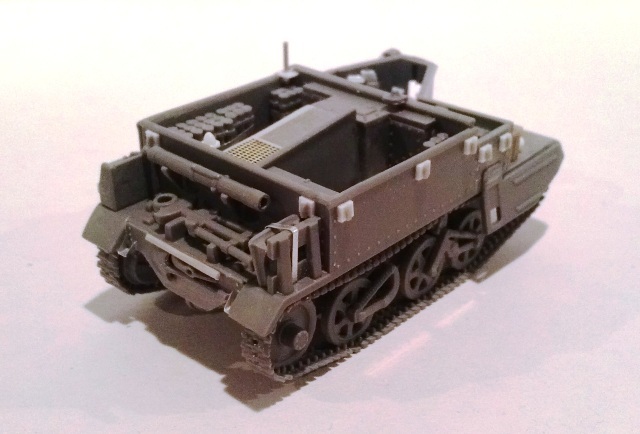 In the April 1944 Service instruction book the welded Mk III is called Mk IIIw (such as for the Cromwell Mk Vw). In the MAFVA census number list, there are only one UC and two AOP batches named as Mk III. 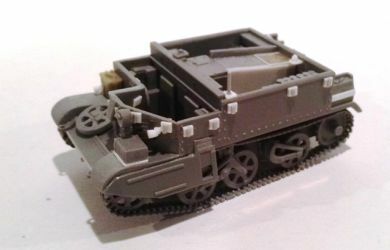 The UC T331701 - T334900 batch was cancelled and not produced (“Universal carrier 1936-1948” by D. Fletcher) while two other batches ordered as Mk II (T272101 - T272884 and T339801 - T340408) were produced as Mk III. On the basis of the differences found from the former marks, the Mk III had a new engine cover with a different air inlet and a new transversal division plain plate (which is more visible in photos) without the large rectangular slots just above the forward seats. If this is the rule, also the batch T245780 - T249540 which is identified as Mk II in the MAFVA list should be Mk III. The batches produced as UC were made when the standard was the Mk II, so they had the same skirts, lamp and rear bin. The AOPs were made when the standard was the Mk I and had the same skirts and rear bin while a single lamp was placed on the glacis. Speaking about how to have something a little more different, apart fom the production wheels with narrow “T” section spokes, I’ve seen two variations. A first variation had a concave plain centre with six large rounded holes (see for example T274089 or T253118); the second one had larger spokes (see for example CT43325 or T202226). As far as I’ve seen up till now these two types look to be used as replacement and not as production line set. I didn’t study the early production Carriers in detail, so it is possible that I ignored some details or that some comments about them are not pertinent. 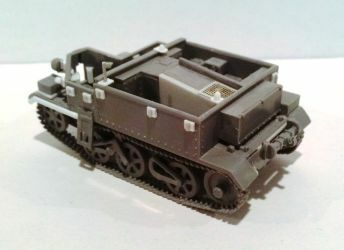 Other minor layout differences look to be given by the crew role; see here: http://www.vickersmachinegun.org.uk/transport-universal.htm . To add other modelling possibilities, home made bins or racks or arrangement alteration added at the unit workshops can be seen in the original photos, see for example the airborne Universal Carriers. 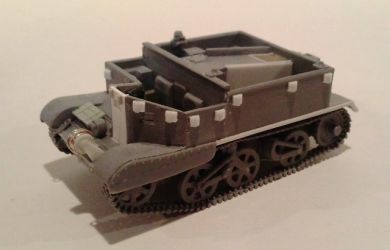 Also the Russians lend-lease vehicle and the German captured Carriers give us opportunities to model different subjects. 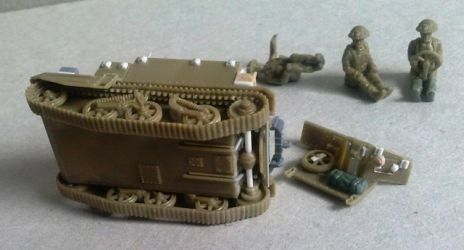 For some useful Beute Bren Carrier (e) photos see here. A useful information source can be found here. 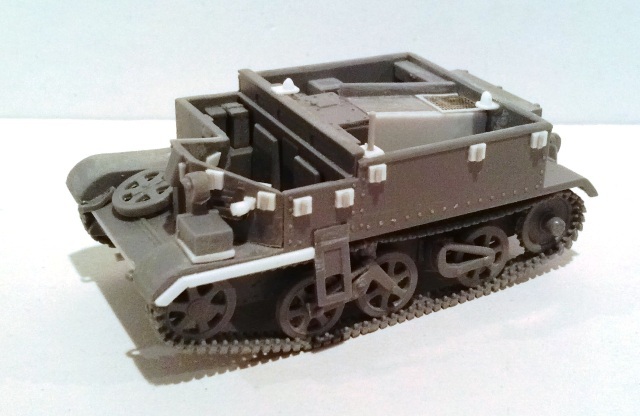 The look of the mouldings gives a sober impression, only 27 pieces composes the vehicle set (comprising the optional parts and the large roll); some details are not very finely sculpted and the wheels and tracks sets are solid single pieces. Coming from the war games world, this kit has the crew (very well!). 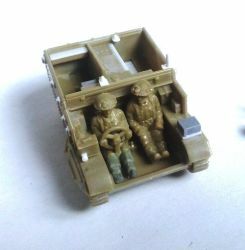 The two figures for the driving compartment are a bit stiff, while the rear compartment figures relaxed pose are more convincing, however they are moulded for a Carrier stripped of the usual items stowed in the rear compartments. The heads are given as separate parts. This is positive: the faces are moulded from the front; the head can be slightly turned and can be easily swapped. The PSC heads look to me too much near the chest so I shimmed the neck a little. The poorest detail of this model is the solid over simplified exhaust area. I filed away the “box” with the moulded on the transmission axle which fills the area, keeping just the differential housing. I closed the wall with thin plastic sheet and then I added the details. The axle was made with plastic rod while the exhausts were made with stretched sprue. I drilled the holes in the front towing points moulded on the glacis, which were also thinned. I thinned the exposed fender thickness. The mudguard skirts were sometimes removed, but the tracks miss their external details where the skirts have to be glued making their use compulsory. The hole for the Bren gun could be closed with a simple rectangle when the gun wasn’t used. If the Bren is to be installed, a replacement is recommended. The spare wheel could be fixed with a large roundel as for the kit, or with a little rectangular shaped plate. I changed it but the kit detail can be kept as it is. The Mk II rear bin was heightened with thin plastic sheet. Mk II sides could have two further steps just in the mid of the rear compartment. The kit doesn’t give them, but this is not a problem because they don’t look to have been widely used. The Mk II single light is huge. I replaced it with a scratchbuilt one made with sprue sections and then I detailed it with its support and its thin metallic wire. On the front there also were smaller lights; they were added (with their supports) using plastic rod shaped as a half egg. A simple improvement can be made adding the deep wading kit interlocks. These were thick rectangular plates, with a pipe segment welded on and bolted to the hull sides. I made them with plastic and stretched sprue. 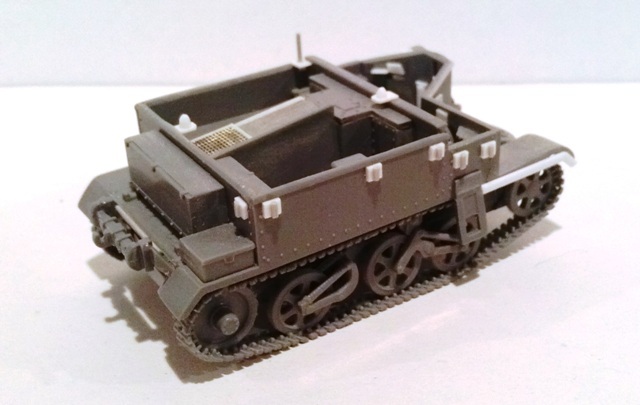 The full deep wading kit is quite easy to scratchbuild and is a good way to have something different from the models proposed by the manufacturer added an IBG towing hook which was in the spares box. As already seen, its absence is not really a problem. On the front plate there was a short horizontal closed pipe. It was access for the starting handle. I drilled the hole where it will be glued after the driver compartment will be closed because the upper millimeter of the plate is the glacis thickness and the surface will be sanded smooth. The glacis overhangs the front plate a little. I added this with a thin stretched sprue segment. In the photos I’ve seen the left side of the engine cover was vertical. To correct this I placed a new side widening the kit deck at left. This means I lost the riveting row. I’m not so clever to make a new one. 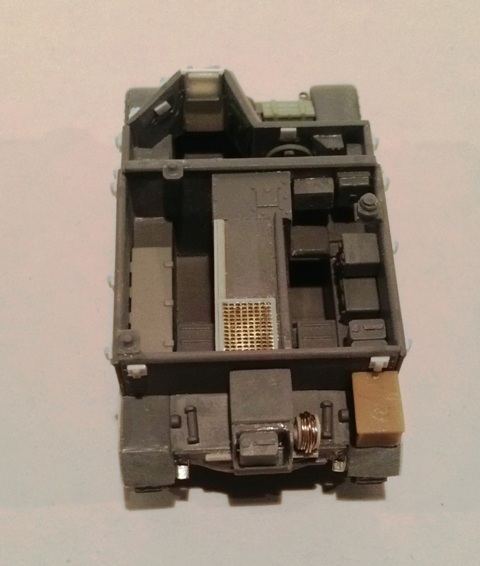 I made the instrument panel with a piece of plastic from the thick squared sprue. I also added the inner shutters of the vision slots made with very thin plastic sheet. The inside is very empty. Some bins and some boxes are needed to fill the driving and the rear compartments. Inspiration was found in photos. I also added the shelves for the antenna bases. With plastic rods I made the two fire extinguishers. They were of the brass colour types which were placed at the sides of the Bren gun mount (the handle was “T” shaped but after having had a nervous collapse I left it alone as you can see. I know, the vertical arm is missing). Also the support for the Bren gun was made with plastic. In the co-driver area I added the shelf for the 2” mortar. The seats are missing in both compartment, I didn’t add them because I planned to use the crew. About that, I added the legs to the driver. After painting I’ll add the Bren gun and the Enfield rifles taken from the spare box. The former will be stowed between the driver’s compartment seats; the latter in the rear compartment. The double guide teeth are solid. 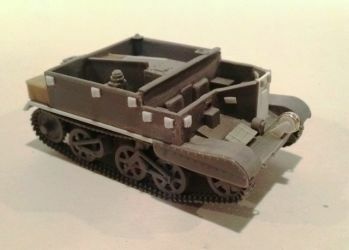 As for my S-Model Stuart tank, the solid tracks were cut in sections and glued in place after having divided the guide teeth with a file. Thanks to Gianluca Trivero who shared one of his three kits in the box. These kits need very few words to describe. When I saw the photos of the mouldings for the first time I thought I was seeing 1/35 kits! Very well detailed, this kit can almost be built straight out of the box. Some details thickness look a bit oversized, but still look well. A bit hard to achieve is a correct track assembly. I didn’t use the template present in the box. The interior is well detailed and a lot of items are given to fill the compartments. The glacis overhangs the front plate a little. I made this with a thin stretched sprue segment. As already told, I chose to ignore the wall thickness, but the rear compartment handrail is squared, which is not completely wrong. It was used squared on the early production Mk I. I sanded it rounded. On the front plate I added the starting handle access with a stretched sprue segment. The front towing points are plain and too thick. I drilled the holes and thinned them before gluing on the glacis. Attention must be paid because they are not identical and are not interchangeable. The right side of the MG position had a narrow strip welded on the edge. Also this was made with a thin stretched sprue segment. PSC has this detail moulded on. Just under this segment I added a little thin plastic trapezoid. It is the shutter of a vision slot, missing in the kit. I thinned the exposed fenders. The Mk II single light received its wiring. I also added the little lamps present on the Mk II front. The Mk II skirts upper edge doesn’t have the gap and doesn’t look well. I reshaped it and thinned the edges on my Mortar carrier. 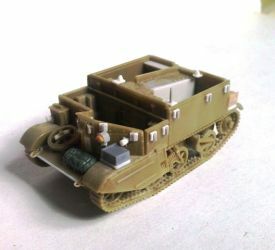 To have something a bit different I made the Mk II without the skirts; the exposed edge of the mudguards was made with thin plastic strips. The steps in the skirts were sanded on the upper part, which were not flat. The rear steps are small and solid. I replaced them with thin metal strips folded and cut to the shape. Also my IBG carriers received the deep wading interlocks. On the UC two of them are missing because they are placed where I have to glue a couple of crew items. As for the PSC kit (see above) I corrected the engine cover. Here too I lost the riveting row. I added the missing shelves for the antenna bases because these small parts can easily be lost. With plastic round rods I made the two fire extinguishers of the “early” brass cylinder type which were placed at the sides of the Bren gun mount (these too with the handle not “T” shaped). I’ll add the stowed Bren gun and Enfield rifles after having painted the interiors. The raised strip on the deck is too thick; the best thing to do is replace it… I kept it as it is. The links pitch should be tighter. The effect is that they look too much spaced. Anyway the tracks look well and I kept them as they are, but for who is more finicky an aftermarket set is available. In my kits the wheels spokes were almost joined by the (thin) flash of the mould. I carefully cleaned them before I cut them off from the sprue. A careful job is needed to cut off the sprockets because the presence of the sprue between the little sized teeth. I didn’t use the template for the tracks, preferring to glue them directly on the wheels set, adding a little sag on the upper length. I wished to also have a Carrier with the Mk I skirts. As far as I’ve seen up till now, with the British troops in Normandy the UC Mk Is were rare. The Universal Carrier Mk Is looks to be more widely used by the Canadian troops. For mine I opted for an AOP Mk III (the AOP Mk I was based on the earlier Scout Mk I and the AOP Mk II on the UC Mk I), although the Mortar Carriers Mk I (see for example T80222 or T167648) were used as well. The main difference between the other marks was in the engine cover, which had a different air inlet layout. The “V” shaped part was cut off and the holes closed with plastic. The air inlet on the division plate were erased and the hint left at the end filled with cyanoacrylate glue which fill very well the little sinks. The Mk III had a welded hull, so I erased the riveting. An easy way to recognize a welded hull in low definition photos (were the riveting is not well visible) is the raised lower edge of the upper side plates. A simple plastic strip did the job. The skirts are well done and need only to be thinned. If these are not used the mudguards edge is correct as it is. As far as I can tell, the Mk I rear bin is a millimeter too long and the rack a millimeter too short. I shifted the engraving forward and thinned the rack. 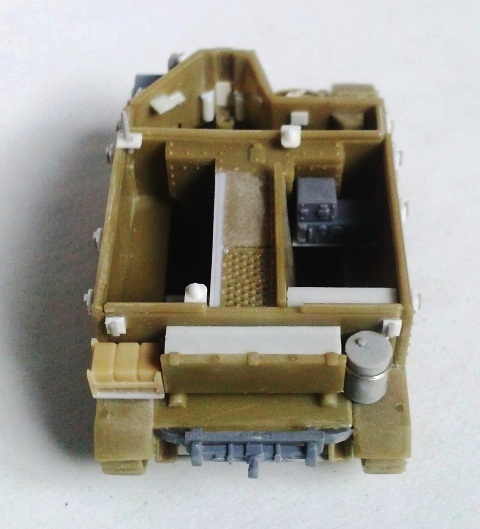 The Bren gun position was closed with a new flat plate, where I cut the window. This was closeable with a sliding plate which could lifted to see through. I replaced the double lamps with a late type single one placed in the middle of the glacis. 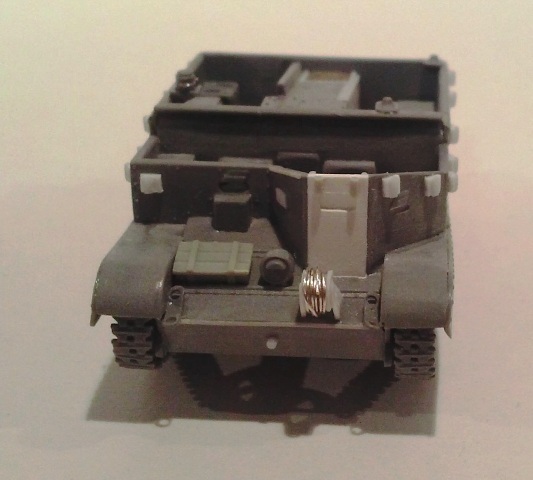 Photographic evidences shows the absence of the spare wheel on the glacis. Its place was often used for boxes or soft items.On the rear shelf right side and on the glacis there were two cable reels. I made them with plastic and thin metallic wire. I suppose there were other little differences, but I was satisfied and I didn’t add other. When I bought my kits, there were only two out of four kits in the shop of my town: the Mk I w/ Boys rifle and the Mortar Carrier Mk II. They were pretty good for my needs. Mk I T78987, Red Army. It is correctly depicted. Mk I CT112308, Loyal Edmonton Regt., 2nd Inf. Bde., 1st Cdn Inf. Div.. 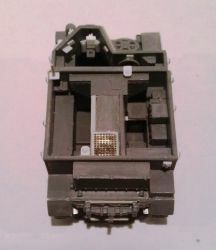 It is correctly depicted, the right light is missing and its place is taken by a metallic box. The AoS number on the front is symmetrically placed to the Divisional badge, the Boys rifle is not on the firing position. Mk I No WD Beute carrier. It is correctly depicted, but looks to be unarmed. Mk I CT43054, 7th Recce Regt., 3rd Cdn Inf. Div., . Mk I T17068, 5th Royal Hampshire Reg., 128th IB, 46th ID. The suggested WD number falls in a Beaverette batch. Anyway, it is only suggested in the instruction, being absent in the set. Mortar carrier CT201944, 43rd Infantry Division, 43rd Recce Regiment. If correctly depicted by IBG, this should be the first batch based on the Mk II hull in the WD number sequence. Mortar carrier T228174, 25th Uhlan Polish Regiment, 5th Polish Infantry Regiment. The bison on a yellow background looks like the badge of the 11th Armoured Division. The 25th Ulanow Wielkopolskich was a Recce Regiment; the blue/green background is correct as well as number 77. The comparison between the kit makers doesn’t give us a winner. IBG kits, despite their faults, are still great and look well with very little extra detailing. As a wargamer kit the PSC kit is very good, simplified but correct. A feature shared by both kit makers is the engine cover section which is symmetrically sloped. I didn’t find photos which show this engine cover type and I don’t know if it was really used; anyway I modified it for my models to a type that is surely correct. 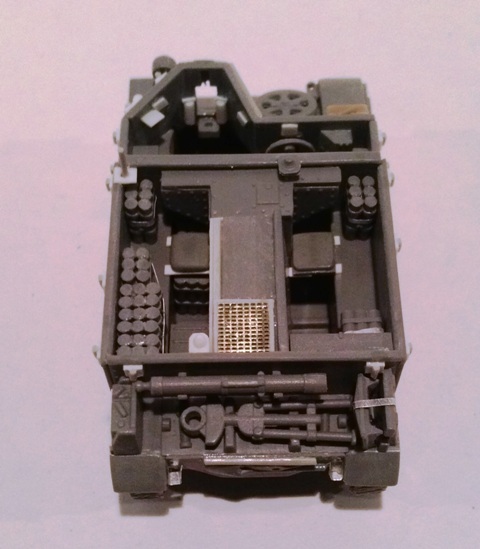 Surprisingly, some PSC details are better depicted, like the rear steps, the engine deck mesh, the Mk II skirts and the gunner position plates. 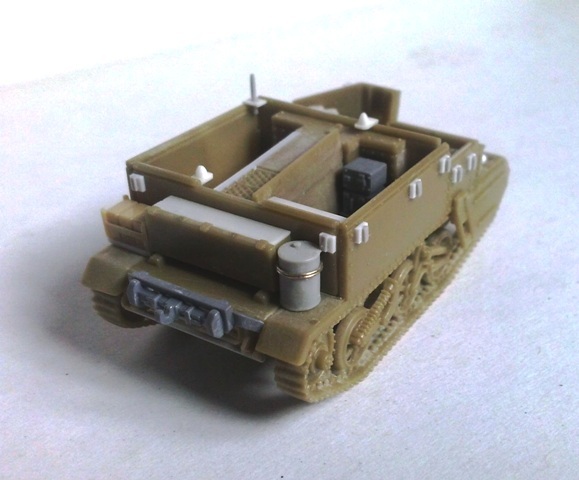 For both, an aftermarket set with the engine cover, PE upper hull plates and other little details would be useful. The kits also offer a good base for easy conversions which only need some plastic sheets and rods. 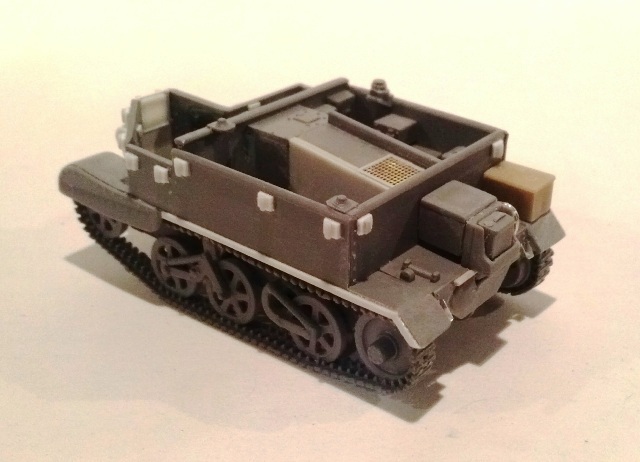 At the end I think that the IBG kit is certainly better detailed, but if your model is packed with different sorts of stowage which hide the details and has a crew, the PSC kit is, with a little elbow grease, a very good alternative.